When you think of steel buildings, you probably imagine something simple and gray. 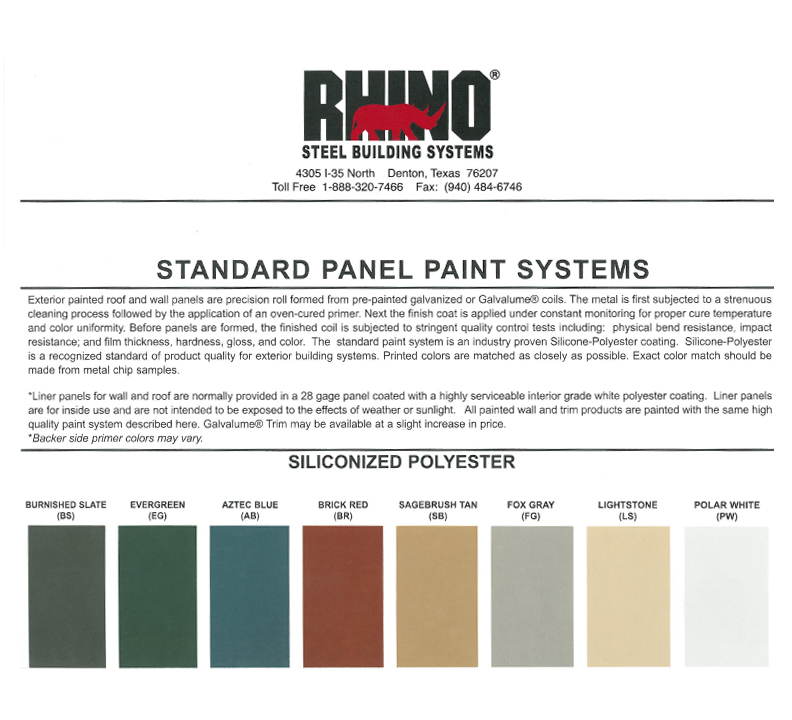 RHINO Steel buildings, however, come in a range of commercial building panel colors. These metal building color schemes are made of an industry proven Silicone-Polyester coating that is a recognized standard of product quality for exterior building systems. All of the painted roof and wall panels are precision roll formed from pre-painted, galvanized or Galvalume coils which are cleaned, coated with an oven-cured primer, and then painted with the finish coat that is monitored for proper cure temperature and color uniformity. Each panel is tested for quality control, including physical bend resistance, impact resistance, film thickness, hardness, gloss, and color so you know that your RHINO Steel building is made to last. Metal building color options include: Burnished Slate, Evergreen, Aztec Blue, Brick Red, Sagebrush Tan, Fox Gray, Lightstone, and Polar White. The steel building color chart below is matched as closely as possible, but due to differences in screen settings, metal building colors may vary slightly. We recommend you make color decisions based on metal chip samples to ensure that you are choosing your ideal steel building color. If you have questions about our panel color options, contact us! Share the post "Panel Colors"